A medium difficulty fish for aquarists with at least one years experience. Peaceful among groups with only one male and many females. The Six Line Wrasse is a curious rock dwelling fish who always seems interested in its surroundings. It will act aggressively towards slow moving or easily intimidated fish. It normally hides within small caves or crevices if nervous. At night the Six Line will find a comfortable place within the rock caves to sleep. It is an exceptionally fast moving fish and catching it with a net is nearly impossible. Carnivorous, enjoys meaty foods (scallops, shrimp, fish, brine eggs, krill). The Six Line is an active invertebrate hunter that will attack animals as large as ornamental shrimp and sea urchins. They also remove unwanted pests such as bristle worms and mantis shrimp from aquariums. They will be very picky eaters when first introduced into an aquarium. 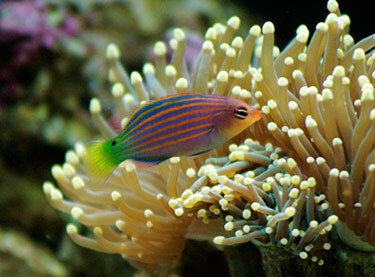 The Six Line Wrasse is a long smooth fish with six purple and red stripes running horizontally down it?s body. Its belly is a light pink or peach. It is difficult to name a color that the Six Line doesn’t have, its bright green tale red and white striped eyes make it an especially beautiful aquarium fish. It grows a maximum size of 3 inches, but most species in fish stores will sell them at closer to 1.5 inches. @zacguitarshreder12 That’s cool, I got a 10 gallon frtahwseer fish tank for my birthday a year ago, and I have been saving up for a saltwater tank. I love my frtahwseer tank, but having a saltwater would be great too! I only have gotten $100 so far, but it will be worth it.